Located at the heart of the old town on the Via Del Giglio, The Boscolo Hotel Astoria Florence has been recently restored in true Italian style. The hotel is, in fact, made up of two former palaces belonging to notable Florentine families: The Palazzo Gaddi and Palazzo Arrighetti. It was during his stay at the Palazzo Gaddi that John Milton conceived one of the greatest pieces of English literature: Paradise Lost. The room in which he worked is today used for business meetings. 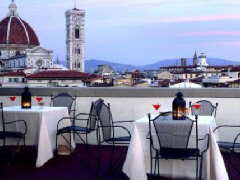 The four-star rated Boscolo Astoria Firenze features 98 rooms and is located close to the Church of Santa Maria Novella.